I recently acquired a PAiA 2720/R modular that I am restoring. I remember when these came out in the mid 1970's but by then my interests had shifted from music synthesis to microprocessors and computing. I didn't get back into synthesizers until later so I missed out on most of the early PAiA gear. The skills of this builder were a bit low so I am spending a lot of time removing blobs of solder and cleaning up the PCBs. As of now I have the cabinet, keyboard, keyboard controller, glide, and the power supply rebuilt. I'll verify the keyboard functionality then move on to the VCO and then finish out the rest of the modules. I like to keep vintage gear as original as possible so I am not trying to replace wires and components so we'll have to see how much of it is alive. Photos and progress at my PAiA 2700 Restoration page. thanx..... must be a labour of love. Excellent photography, layout and writing in your blog. A pleasure to read and learn. Fantastic work as always, Dave! cool project. i have a similar paia 27xx that needs a full restore so it will be really cool to see this progress. for my part, i kinda envisioned rebuilding the cabinet entirely. it's not exactly the best wood working to begin with and mine is not in as good a shape as yours. nice work! i just went through a mostly 4700 series paia modular that a customers going to be buying and forgot how good the ring mod and spring reverb sound. i think we are going to keep the next system we get and replace all the jacks with banana jacks cause it'll be way more useful that way. we have most of the most sought after vintage modulars in our studio, but how many of them can you nearly see your reflection in? You REALLY need to replace the caps in the power supply with 4700uf newer ones. power supply ripple was a major issue with the 2700 and this will save you grief later! Now I need to look at the glide and then back to calibrating. The VCO output levels are off as well. The instructions state they should all be 0.5V (rms or pk-pk?). Ramp and Pulse are 1V pk-pk and triangle is 0.4V pk-pk. The design uses the first half of the ramp wave and then switches half cycle to the inverted ramp. 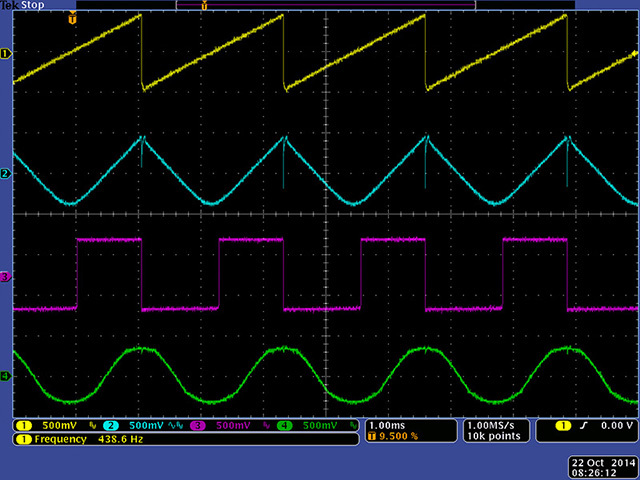 Add in the diode drop and the triangle level makes sense. I might want to increase the triangle gain also. I'm not sure I ever see myself using this but it is interesting to get it working again. I have to believe some of the user's grief was intermittent power by soldering stranded wires to the piano wire bus. 800F and silver solder does the trick but I certainly didn't have that capability in the '70's. I finally finished my 4700/2700 restoration and am working on putting it all back together again in the road cases. That's the hard part: getting everything lined up! Pictures will be coming soon. I bought an old 2700 cabinet with the intent of creating a 2 VCO synth with an improved power supply, digital keyboard and the 8780 D/A converter. Somehow I don't think I'll ever get around to it! I assume I will. I want to get everything working and then figure out what I want to upgrade and place an order for all the parts at once. Hmmmmmm ... yes indeed the ripple shows up everywhere. I ended up replacing them with two paralleled 3300 uF capacitors as they were the only large ones I had with a small form factor. They stack quite nicely on the power supply PCB and cuts the ripple down considerably. Most of the issues with this synth were electro-mechanical including corroded jacks, poor soldering, broken wires, etc. and of course the rock-hard rubber bushings in the keyboard. It cleaned up quite nicely. I have updated a number of photos on my PAiA 2720/R Restoration page. Next to do is a final calibration with the PAiA power supply and then I will add some finished photos. I had a 4700 a long time ago. It was worthless with the power supply that came with it, lots of ripple and noise. The first thing I did was build a new power supply with 3 tab regulators. I think I'd do that and not even worry about re-capping the existing supply. All done. Everything calibrated up nicely and the ripple issues are now gone. I have **way** too many hours in this but wanted to see it through. I didn't have to replace that many parts - a few jacks, capacitors, op-amps, and resistors, but I had to rebuild the keyboard and basically rebuild every module to improve the quality from the original builder. I only did five mods - remount the bottom rail wood bracket, insulate the AC mains wiring, increase PS filter capacitors, increase the triangle output level, and make the VCA fully cutoff. Other than that I kept it stock. I have new photos and a scope image on my site at PAiA 2720 Restoration page. Wow! That cleaned up nicely! I haven't seen the inside of the 27-47xx series before. Nice! Any sounds recorded? The cabinet sides and front were in reasonable shape and put together fairly well. The rail across the back was stapled on with too short of staples. The left cheek block is quite crooked and the opening for the glide is too large. The rail that went across the keyboard was very loose and was mostly held in by the panels. The panel screws were all stripped. The bottom didn't fit flush so one corner stuck out about 3/32" Although the keyboard was screwed in with brackets they could move side to side and the keys would bottom out on the wood blocks that the front lip of the keyboard would fit into. However, there were no bad gouges on the wood. I started with the bottm and sanded with very coarse sandpaper to level the bottom with the edges. I did take off several layers of ply. I tapped the keyboard frame so I could directly screw the keyboard to the bottom. I removed the internal blocks and made sure the keyboard was straight and even side to side. I used epoxy putty to build back the corners of the glide cutout so I had something to screw into. I glued and nailed the bottom rear bracket securely to the sides. I tapped all the stripped holes for 6-32 and mounted a module to each end of the top and put it in place. I made a template of how the panel should fit to locate the bottom and marked each side of the case. Those marks would locate the bottom rail and I could measure the space between the cheek blocks and the bottom rail. I made wood spacers to accurately and securely mount the bottom rail. I also used the bottom rail to hold an insulating paper over the back of the keyboard to protect the bottom of the PCBs from shorting. When the cabinet was all modified I then restained it to fill all the nicks and gouges and then used a single coat of polyurethane to finish it. It is very soft wood but I wanted to keep an original look. If I were to have remade the cabinet, I would have kept the sides about the same but the keyboard opening is too wide. I would have made the cheek blocks look the same. The one on the left has molding along two sides to shape it while the one on the right is square. The width is a bit too wide for the sheet metal top cover. I thought about adding a bracket on the rear for the top/rear cover. The sheet metal is held on each side so it can bow in on the rear. There are exposed PCBs there without much clearance but mine was reasonable secure so I left it. What I don't know is how the cabinet came originally. I assume all the pieces were cut and the builder just had to assemble it. However, they wouldn't have used staples so I'm thinking these were pre-built. If so, it was built crooked. The only other PAiA cabinet I have is the Theremax and I know I had to assemble it. Beautiful work. How long did it take start to finish? The cabinet went slow because I had to wait for glue, stain, and such to dry. The cabinet probably took 5 hours total over a week. The unit took an hour to disassemble, the keyboard took about 3 hours to rebuild, and maybe 2 hours x 11 modules plus maybe another 3 hours for the keyboard divider and controller boards. Verification of each module varied but probably another 3 hours total and an hour to calibrate. I probably spent another 0.5 hours verifying the entire synth. So, if you add all that up probably close to 40 hours. Then of course was the time spent searching the web for documentation, buying tip jacks and making the cables, and designing the new glide panel. That was probably easily another 5 hours so call it 45 hours plus. It was way too much work for what the synth is worth but I was somewhat reliving my youth. I did things like replacing all the module power cables so the color code was uniform. They were all different colors so some of that would be optional work. I spent way too much time on the VCA because I couldn't get it to work on the bench. Then it finally dawned on me the inputs have to be capacitively coupled or the input bias is way off. That was probably the only surprise other than playing with the VCO. I spent some time on it looking at the linearity only to decide to deal with it with the 37 trimmers on the keyboard. Why when I measure everything it is perfect but when I try to reassemble the pieces everything's off??? I think emmaker is right. A redesigned regulated power supply is the way to go. Here's a link to re-order the power supply and connector boards that I laid out for my 4700 system update. I can make a BOM if there's any interest. I used one board for +9V, -9V, and 5V (for some DIY modules with micro controllers) and a separate board for +18V. The regulated power kills a ton of the noise. Now I don't have to comb filter everything I record. Scott Lee was talking about issuing a new 4700 fully regulated power supply. You might bug him and see if it's still in the works. We worked together on adding 18V regulation onto a 9700 power supply to power my 4700 rebuild. I have more than enough juice to power two full dual wing cabinets. Nice job! I built one of these in college. The keyboard found its way into a 4700 system which I still have stored in my basement. The wood case is long gone, however. Fancy! I've had a mostly-functional 2720 since about 2002 or so that I picked up with the thought of building out, restoring and turning into a wall of awesome. 13 years later and it's still stuck in it's mostly functional state. Life and whatnot - hopefully I'll get to it next year. I started with a PAiA 2720 kit in 1973(?). After much time spent I was finally notified by PAiA that the 2720 Oscillators could not be tuned correctly. They could be tuned to a chromatic scale, but then if the pitch knob on the keyboard was turned, the 2720 oscillators were no longer chromatically tuned. I was too far into this project so I bought a number of 4700 modules when they became available. I was shopping at an Army/Navy surplus store and came across a box full of 1/4" TS jacks with switches on them. Insert a 1/4" plug and the switch opened replacing the switched wire with the TS plug. They were quite high quality jacks and there were 50 in the box. I built larger modules and fit them into an oversize case. Knowing quite allot about the Arp 2600 I set about to build a Synth using the same Pre-patched, plug-n-patch system. I bought many modules, almost all 4700 series such as: 4 oscillators, 2 Bandpass filters, 2 low pass filters, several ADSR's and several AR's, 2 ring modulators/noise sources a number of LFO's including a LFO that I made from an Intersil 8038. I also bought a 10 segment sequencer, a ping pong and many modules that I can no longer remember. I was also making projects from Simonton's book "Projects for electronic musicians" or something like that. I had a great deal of fun and have had an interest in electronic music and synthesizers ever since. I think I ended up with 20 some modules that were in a case 28 inches wide by about 36 inches tall. I never had all that much of a musical aptitude but I sure could make allot of crazy sounds with my "Monstrosity". Then came the stupidity. I sold it for $200 or something like that. Would I do this again, of course not. Now I have a Tri-amped PA with Pro amps, Behringer 2496 Eq's and XO's, an MCV 8 channel volume control, a mixing board and a quad limiter as my home theater and more importantly to handle all of my synths. I need to take control of all the MIDI cables and CV and trigger cables all over the place. I guess I finally came full circle.